Sterling Brown and D.J. Wilson will join first-round pick Donte DiVincenzo on the Milwaukee Bucks‘ summer league team. 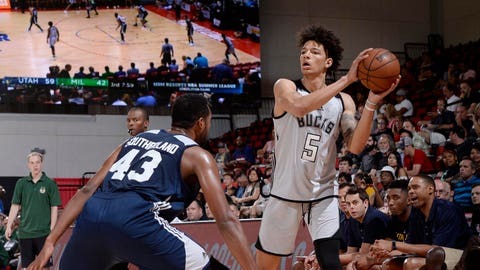 The Bucks announced the full roster Monday, a group that also features James Blackmon Jr. and JeQuan Lewis of the G League’s Wisconsin Herd. Brown made 54 appearances for the Bucks last season as a rookie. Wilson, the Bucks’ first-round pick last year, made 22 appearances. The Bucks kick off the summer league schedule Friday, July 6 against Detroit, then take on Dallas on Sunday, July 8 and Denver on Monday, July 9. The results of those games will determine the Bucks’ position in a double-elimination tournament, which begins July 11. # PLAYER POS HT WT COLLEGE/COUNTRY PREVIOUS TEAM NBA EXP.